John Lang captures the imagination of the Husker community by setting a Guinness World Record for largest logo made with interlocking plastic bricks. College of Business faculty and students recognized for recent achievements include Deb Cosgrove, Zach Holm and John Lang. Deb Cosgrove, associate professor of practice in accounting, received the Outstanding Faculty Advisor Award from Beta Alpha Psi, an international honorary organization for financial information students and professionals. Five professors worldwide earned the prestigious honor. Zach Holm, a graduate student in the master of professional accountancy program from Omaha, Nebraska, was one of 72 students worldwide selected to participate in “Project Run With It,” a significant real-world consulting project for Beta Alpha Psi members. Students were selected for the opportunity based on their academic prowess and service to Beta Alpha Psi. They worked together to develop solutions to business problems of an actual nonprofit in Washington, D.C. at the Beta Alpha Psi annual meeting. Students had approximately 24 hours to read, research and create a presentation to a panel of judges from the nonprofit. 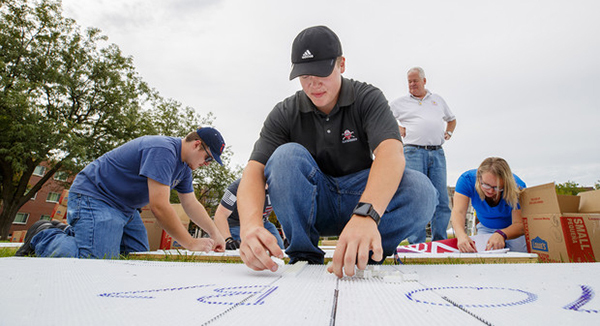 Sophomore business administration major and Omaha, Nebraska, native John Lang and volunteers set a Guinness World Record Aug. 31 for largest logo made with interlocking plastic bricks. The group used 184,320 bricks to construct a giant flag with the Nebraska “N” on it on the greenspace north of the Nebraska Union. Stories on the project appeared Sept. 1 in the Omaha World-Herald, Norfolk Daily News, KOLN/KGIN and KNPL.